The Vox Media Audience Experience team set out to explore our mobile articles, with the goals of improving our page depth, bounce rates, and recirculation. The aim of this work was not to better accommodate the responsive web, but to elevate the entire primary experience our readers were using to consume our content. As lead UX designer, I started mapping out concepts for recirculation strategies, navigation adjustments, and interaction patterns. As a blue sky project, we tested prototypes internally at Vox to refine and validate an approach. 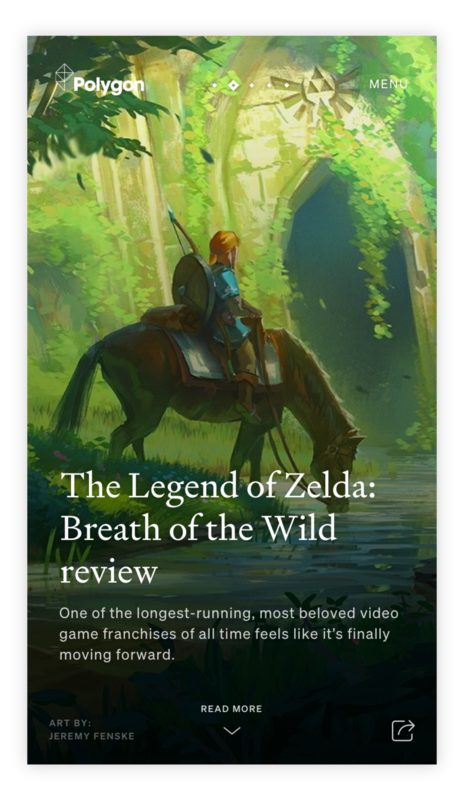 As a result, we landed on a framework that allowed for swiping through stories at any point in an article, and created “bookend” views with more content. We realized we needed to develop a better way to preview content for users than what our current mobile layouts provided. We landed on a card concept for a quick browsing experience that feels instantaneous and removes the barrier to entry that users could experience by tapping a link to get more context for a story. Once the team was feeling confident with the overall patterns, we moved into visual design. The card pattern paired with updated typography systems allowed us to create instantly impactful designs that felt more native for a mobile format. The final UX allowed going deeper into a subject and easily surfacing to higher levels for context, providing instant-access navigation across a site from any point in a story. This project was a blend of brand, visual expression and user-focused experiences that inspired future thinking for Vox Media’s mobile-web experiences. Bethany has an excellent post with her perspective on evolving the audience experience across brand, visual expression and user-focused experiences. Check out Andrew’s fantastic prototypes and more in-depth thinking behind the UI explorations.